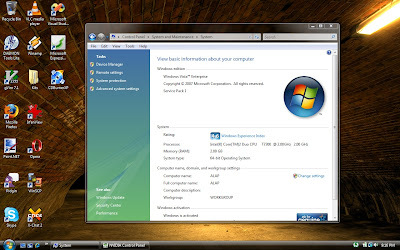 I've upgraded my laptop OS to Windows Vista SP1 Enterprise 64 bit, and I've had a hard time finding updated drivers from the manufacturer. The trouble with NVIDIA laptop graphics adapters is that you need to use the vendor driver, instead of the one from NVIDIA.com. I've got a 8600 GT mobile graphics adapter on this Acer 5920G laptop, and the Acer drivers are ancient (101.45), compared to 169.12 version currently available from laptop2go. The good news is you can grab an updated copy from the LaptopVideo2Go website, copy the modified INF file, and enjoy :-).